Adjusting to life back in the US after more than a decade in Asia, I’m still startled at the meanness of language and attitudes in public life here. I’m so unhappy with reporting and commentary about presidential politics that I often avoid the news altogether--even my beloved New York Times, which I read every day in Singapore. Public discourse on agriculture development and technology also seems increasingly fraught with controversy, name-calling and dramatics. Coming from a customer service background and directing this book primarily to businesses, Jay draws on extensive research to describe ‘haters’ who complain about a business or service, including how and why they do it. 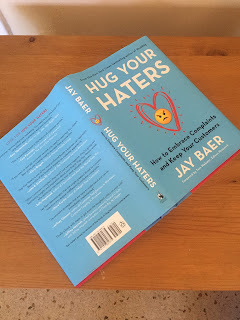 The “Hatrix” (complete with pull-out infographic inside the book) focuses on two categories of Haters: Offstage haters who tend to make their complaints more or less privately in email or by phone, and Onstage haters, who complain more often and very publicly on social media, review sites and other public forums. Offstage haters expect a reply; onstage haters are looking for an audience more than response – which may explain why they tend to be more cutting and extreme in their comments. With more and more companies using Twitter and Facebook to interact with people, customer service has become a ‘spectator sport’ according to Jay, and that means how companies respond to people can have ripple effects far beyond a single complaint. Staying silent actually speaks volumes. Jay recommends that businesses respond to every complaint they get, in the same private or public channel it was made (i.e., email, Facebook), with at least two attempts to resolve it. Customers feel better wherever and whenever you respond, he says. For companies, Jay describes four benefits of responding to every complaint. There’s the chance of turning them into an advocate for our work. According to the data, haters who have their complaints addressed, whether onstage or offstage, sometimes become advocates for the business. Those with unanswered complaints often become even less of a fan, and everyone in their network probably knows it. Complaints and comments can be a good source of intelligence for what’s probably on other peoples’ minds, the silent but larger group of people who are confused or dissatisfied but don’t care enough to speak up. Finally, hugging our haters can help differentiate us from ‘the competition’, by out-loving them. As advocates for agriculture development (or any other public policy goal), we’re in a different boat from companies who are paid to provide products and services. But I think we have a similar challenge when faced with pointed questions from stakeholders and critics of our positions. Like business owners, sometimes we’re too busy and try to ignore it all. Or we’re too offended to let go of arguments. Like businesses profiled in this book, we should do our best to respond in ways that are consistent with the values that have lead us to our work in the first place, whether its agriculture, development, technology, some combination of that or something else entirely. We want to help, so we should show up. We want the science to be trusted, so we should avoid impolite language and ad hominem attacks. Why? Not just because everyone’s watching. We might clear up genuine misunderstandings about our work in agriculture, technology and development. We might build relationships and ultimately inspire new champions. We might understand the questions and core concerns of all stakeholders (not just the noisy ones). We might communicate more effectively and minimize the ‘hate’ in the first place. Now, who needs a hug?